Here's Installment #1 and here's Installment #2. Getting sick of me yet? With Whatever Happened to the World of Tomorrow, I had the opportunity and challenge to design characters from scratch. I created Cap Crater and the Cosmic Kid first, then hit on the idea of giving them the "real life" alter egos of Pop and Buddy later (more about my thinking behind that in a bit). In the next post, I'll go into some detail about the design of each character; for now, I'll just point out that I adhered to the principles of contrast (old/young, tall/short, monochromatic/colorful) and that they pass the Silhouette Test. The very first drawing I can find in my sketchbook of Cap Crater and the Cosmic Kid together. They began a bit more cartoony than they eventually turned out (below). 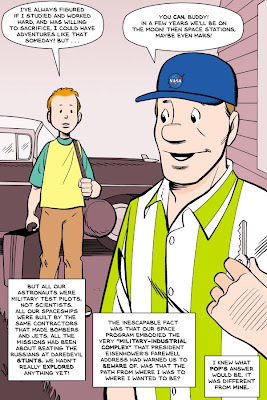 To really talk about character design, I need to get into some of the themes and motifs of the book--specifically, why the comic book Cap Crater and the Cosmic Kid look like "real-life" Pop and Buddy, and why Pop and Buddy don't age like regular people. I wanted to weave three threads through WHTTWOT: A factual account of some historic and scientific touchstones between 1939 and 1975; reflections on the underappreciated effect of pop culture on how people saw and shaped the future; and a simple little story about a son growing up and realizing his father isn't the paragon he idolized when he was eight, meant to parallel the arc that (I argue) society traveled from optimisitic utopianism to pessimistic dystopianism--or as I glibly describe it, going from "Flash Gordon" to "Blade Runner." Cap Crater and the Cosmic Kid could carry some of that load but not all of it. I needed "real people" to live through the times and embody the father-son relationship at the heart of the story. I needed Pop and Buddy. The not-aging-in-real-time thing--which I think really stumped a few readers and I might have handled better--came out of my desire for the father and son to experience the same transition from idealism to disillusion in about 10 years that society experienced in 35 or 40 years. 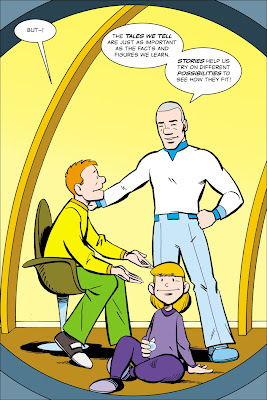 I also aged Pop and Buddy at the same rate as Cap and the Cosmic Kid because I wanted to knot my three threads together in a dateless future (the last chapter) where the characters could be either pair or both, living in the future they all envisioned. 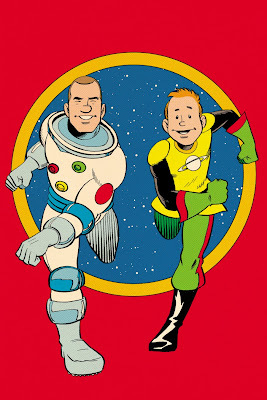 Pop and Buddy (or are they Cap Crater and the Cosmic Kid?) in the World of Tomorrow. This chapter is colored and lettered differently than the rest of the book to press the ambiguity. Reader: "So why don't Pop and Buddy age like regular people?" Me: "Why are you asking about Pop and Buddy, and not Cap Crater and the Cosmic Kid? They age at exactly the same rate." Reader: "But Cap Crater and the Cosmic Kid are characters in a comic book." Me: "And what do you think you're holding in your hands?" A-ha! Then the imaginary reader buys me pizza and beer. The reason I'm over-explaining this is because the skeleton of my story affects the character designs I layer on top of it. For example, Pop's clothing changes through the decades. In 1939 he's wearing a snappy suit, in 1955 he's in work clothes that might be old Army fatigues, in 1965 he's in a NASA cap and Beach Boys-style casual shirt. His clothing helps define his role as a man who lived through those times. Buddy doesn't fill quite the same role. Oh, he still lives through those times, side by side with Pop. But Buddy wears the same turquoise and yellow t-shirt throughout the book to hint that he is a character in a comic whose costume doesn't change any more than Charlie Brown's zig-zag-striped shirt did in 50 years. I thought long and hard about Buddy's shirt. Basically, I needed to dress him so he'd look right in 1939, 1975, and any year in between. A simple button-down shirt or striped pull-over would've worked, but I didn't find them visually interesting. So I was thinking along those lines while doing research for WHTTWOT, which included watching hours of movies shot at the 1939 World's Fair. Then I saw him: ambling across the fairgrounds, a boy in 1939 wearing a baseball-style half-sleeve t-shirt, just like the ones I've got in my drawer. It worked then, it works now, and the contrasting shapes and colors were just what I'd been looking for. Of course I doubt the 1939 kid's shirt was turquoise and yellow (he was filmed in black and white), but I thought those colors were eye-catching and I allowed myself the artistic license. Finally, since it kinda sorta applies, I wanted to touch on my use of color in WHTTWOT. As I've described before, the "Space Age Adventure" comics within the comic were colored in Ben Day dots using era-appropriate palettes. The last chapter is pretty much full color. For the chapters depicting Pop and Buddy through the years, I wanted to use limited palettes in each chapter to differentiate them from each other as well as from the fake comic books and final chapter. I assigned each chapter a "mother color" based on a mood or theme I wanted to invoke. My choice of old-timey sepia for 1939 is obvious; 1945 has the cold gray of World War II movies; 1955 has the blue tint that old photos take on as their red dyes fade in sunlight; 1965 has the magenta hue that poor-quality vacation slides take on as they age; 1975 has purple because, honestly, I was running out of colors I liked and the story takes place at night. The "Chapter 6 (Future)" color just denotes the blue-gray metal of the habitat and doesn't really serve the same purpose as the colors in the other chapters. 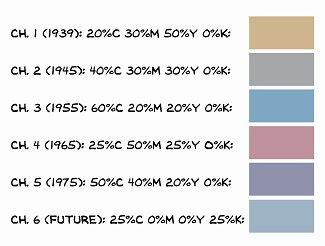 I constructed my mother colors so they'd all have about the same mid-range value or intensity; if you converted them to black-and-white, they'd all be similar shades of medium gray. My rule of thumb was that the percentages of cyan, magenta, yellow and black that comprised them added up to 100%. It wasn't a hard-and-fast rule, since obviously 100% black is more intense than 100% yellow, but more of a guideline that got me in the ballpark. 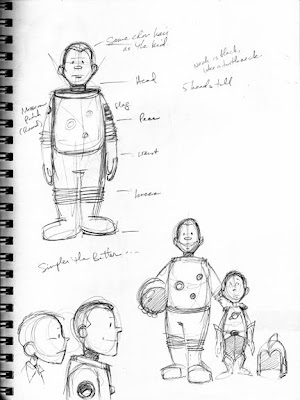 Today's take-away is similar to yesterday's: designing characters involves more than drawing and dressing them. Yesterday, I made the case that your characters' design has to reflect the universe you create for them to live in. Today, I argue that character design can also communicate something deeper about your story's themes, form, and approach to storytelling. Coming up (someday): Why if you meet me in real life and ask me to sketch any character I want, I will almost always draw the Cosmic Kid. EDITED TO ADD: Here's Installment #4. Sherwood, you are the wind beneath my wings.